It's SPRING! Time to Leap into April and into a Honda! 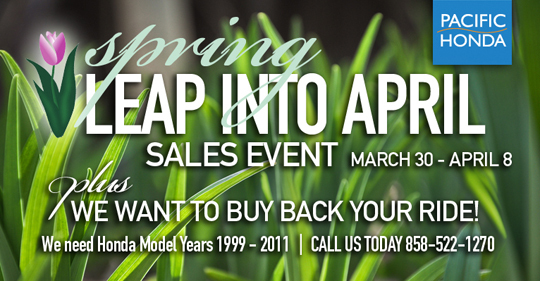 Visit us March 30 - April 8 for our Spring Sales Event! Plus, we want to buy back your Honda! We need Honda Model Years 1999 - 2011! Call us today - 858-522-1270. This award is provided to exclusive Honda dealers that maintain a customer satisfaction score above Honda standards for their customers. 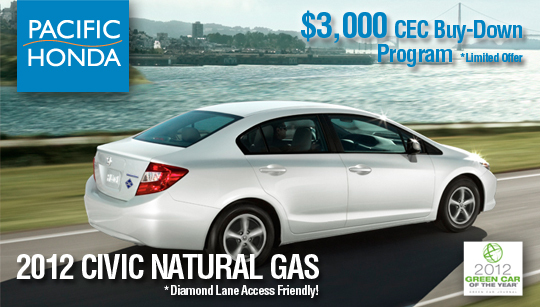 This achievement reflects Pacific Honda's dedication for delivering the highest level of service. The award is based on the feedback from the you the consumer. 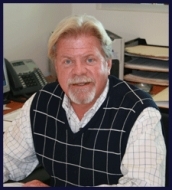 Pacific Honda would like to thank you, our customer, for your support and feedback.